Angelic quotes can lighten up your heart and bring you hope. I wish that the compilation of angel quotes presented here accomplishes these goals. And most of all, I hope you enjoy reading them. 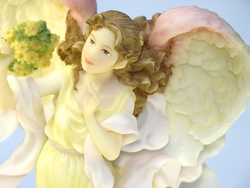 Angels, with their light, divine love and guidance, can help us face difficult challenges. They can also help us find more joy in our lives. In good times and in bad times, angels are there to keep us company. Ready for some angelic quotes? The angelic quotes gathered here come from diverse sources: famous thinkers, literature, the Bible, and modern mystics. Like angel-visits, few and far between? Stood in the circuit of a needle's eye. I hope you enjoyed these angelic quotes. For more quotes on angels please visit the pages below.